Tilting disc check valves produce slightly more pressure drop than swing check valves of the same size. These check valves have a single-piece disc without a hinge. In response to flow forces, the disc pivots about hinge pins that are located within the geometry of the disc and slightly above the center-line of the valve body. Due to the disc rotating onto the seat, the sealing surfaces must be conical. Some tilting disc check valves include a counterweight on the disc, dramatically increasing the disc stability with lower flow rates. Tilting disc check valves were designed specifically to minimize the potential for high-energy water hammer. This objective is accomplished by locating the disc center of rotation a short distance from its pivot point, thus allowing the disc to quickly close with flow stoppage or flow reversal. 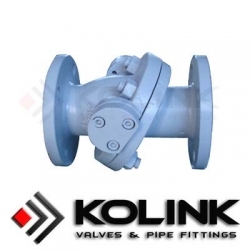 Although it is best to size this valve to be fully open, the disc is reasonably stable under some less than full-open flow conditions. When it comes to maintenance, tilting disc check valves are more challenging than swing check valves. To keep seat leakage to a minimum, the conical seating surfaces of the disc and in-body seat must mate well, and the disc pivot location must be precise.